All Episcopal Churches have a name. The reader should bear in mind that the Episcopal Church in Lexington has had two different names. Until 1972, it was known as the Church of the Good Shepherd. From 1972 to date, it has been known as the Lexington Chapel of Trinity Episcopal Parish of Croswell and Lexington, or, more simply, Trinity Church. This, then, is not a history of Trinity Parish, for such a work would also have entailed the writing of the history of the former Christ Church, Croswell -- something the writer feels he is unqualified to do. It is the writer's fond hope that someone who has been associated with the former Croswell parish will undertake the writing of a suitable history. Any attempt to compile a history of an institution, which is over 100 years old, is an awesome undertaking. It is made doubly difficult when, as in the present case, there is a paucity of written records. Fortunately, the parish does possess minutes of vestry meetings from the beginning of the church until about 1912. Then there are no records until the late 1930's. The parish register of baptisms, confirmations, marriages, and burials is probably complete for this period, but the register prior to 1878 has been lost. The writer has nevertheless attempted to put together from various sources, including "hearsay" when that has seemed logical, a history of the Episcopal Church in Lexington, Michigan. 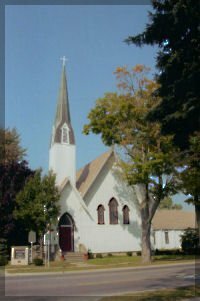 Since Lexington is the oldest town in Sanilac County, this is also a history of the Episcopal Church in the county. Finally, a word about memorials. It would have been most appropriate to include a section about memorials in this history. Memorials have run the gamut from large items such as the carillon and organ all the way down to small items such as a prayer book or hymnal. Because it is not possible to list them all, due to incomplete records, and because an omission would surely cause offense, albeit unintentional, we will not list memorials here. We do ask your readers to go about the church, read the plaques and tablets, and thank God for the generosity of those who saw fit to enhance His house with a memorial to a loved one. For the photograph of the church, thanks to Sherman A. Willson, Professor of Fine Arts at Wayne State University. For their generous contributions which have made the publication of this history possible, thanks to John E. Farrell, Norman L. Parker, Kenneth R. Warren, Sherman A. Willson and one who wishes to remain anonymous.